A bolognino of Gregory XI. 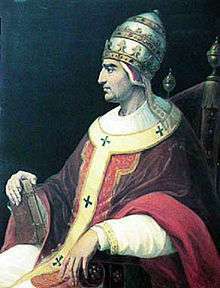 Pope Gregory XI (Latin: Gregorius XI; c. 1329 – 27 March 1378) was pope from 30 December 1370 to his death in 1378. He was the seventh and last Avignon pope and the most recent French pope. In 1377, Gregory XI returned the Papal court to Rome, ending nearly 70 years of papal residency in Avignon, France. His death shortly after was followed by the Western Schism. He was born Pierre Roger de Beaufort in Maumont in the modern commune of Rosiers-d'Égletons, Limousin, around 1330. The nephew of Pope Clement VI, he succeeded Pope Urban V at the papal conclave of 1370 and was the seventh and last of the Avignon Popes. During his pontificate, vigorous measures (e.g., burning at the stake, confiscation of property) were taken against proponents of Lollardy, which had found acceptance in Germany, England, and other parts of Europe. Efforts were made to reform corrupt practices in the various monastic orders, such as collecting fees from persons visiting holy sites and the exhibiting of faux relics of saints. Gregory confirmed a treaty between Sicily and Naples at Villeneuve-lès-Avignon on 20 August 1372, which brought about a permanent settlement between the rival kingdoms, which were both papal fiefs. John Wycliffe's 19 reformation articles on church-related items as he wrote in his On Civil Dominion  and 21 proposed reformation articles of Johannes Klenkok's Decadicon  that he wrote against the Sachsenspiegel law-book. The Decadicon was submitted to Pope Gregory XI in the early part of the 1370s by French canonist and cardinal of the Curia Pierre de la Vergne. Gregory formally condemned fourteen articles of the Sachsenspiegel in 1374  and nineteen propositions of Wycliffe's On Civil Dominion in 1377. His decision to return to Rome is supposedly attributed in part to the incessant pleas, demands, and threats of Catherine of Siena. A return had been attempted by Gregory's predecessor, Urban V, but the demands of the Hundred Years' War brought him north of the Alps again, and Avignon was still the seat of the Bishop of Rome. The project of returning again to Rome was delayed by a conflict between the pope and Florence, known as the War of the Eight Saints. The pope put Florence under interdict during 1376. The return of the Curia to Rome began on 13 September 1376 and was concluded with the arrival of Gregory XI on 17 January 1377. Gregory XI did not long survive this trip, dying in Rome on 27 March 1378. He was buried the following day in the church of Santa Maria Nuova. After his death the College of Cardinals was pressured by a Roman mob that broke into the voting chamber to force an Italian pope into the papacy. The Italian chosen was Urban VI. Soon after being elected, Urban gained the Cardinals' enmity. The cardinals withdrew from Rome to Fondi, where they annulled their election of Urban and elected a French pope, Clement VII, before returning to Avignon in 1378. Subsequently, the Western Schism created by the selection of rival popes forced the people of Europe into a dilemma of papal allegiance. This schism was not resolved fully until the Council of Constance (1414–1418) was called by a group of cardinals. Boldly, the council deposed both current popes and, in 1417, elected Martin V as their successor. The chaos of the Western Schism thus brought about reforming councils and gave them the power over who was elected, replacing (for a time) the College of Cardinals. ↑ Herbermann, Charles, ed. (1913). "Pope Gregory XI". Catholic Encyclopedia. New York: Robert Appleton Company. ↑ Richard P. McBrien, Lives of the Popes, (HarperCollins, 2000), 245. ↑ George L. Williams, Papal Genealogy: The Families and Descendants of the Popes, (McFarland Company Inc., 1998), 43. ↑ Hayez, Michel (2002). "Gregorio XI, papa". Dizionario Biografico degli Italiani. 59. Rome: Istituto della Enciclopedia Italiana. 1 2 "The Condemnation of Wycliffe". Plato.stanford.edu. Retrieved 2013-06-23. ↑ "first Quarter of the 14th Century stooping (county Hoya), 1374 Avignon". Deutsche-biographie.de. 2012-06-13. Retrieved 2013-06-23. ↑ Francis Thomas Luongo, The Saintly Politics of Catherine of Siena, (Cornell University Press, 2006), 25. Carolyn Muessig; George Ferzoco; Beverly Kienzle (2011). A Companion to Catherine of Siena. Boston-Leiden: Brill. pp. 94–95. ISBN 90-04-20555-1. ↑ Francis Thomas Luongo, The Saintly Politics of Catherine of Siena, xii. ↑ Margaret Harvey, The English in Rome, 1362–1420: Portrait of an Expatriate Community, (Cambridge University Press, 2004), 3. ↑ Carol M. Richardson, Reclaiming Rome: Cardinals in the Fifteenth Century, ed. A.J. Vanderjagt, (Brill, 2009), 1. ↑ F Donald Logan, A History of the Church in the Middle Ages, (Routledge, 2002), 308. ↑ Joseph Dahmus, A History of the Middle Ages, (Doubleday Book Co., 1995), 381. 1 2 Joseph Dahmus, A History of the Middle Ages, 381. Ameilh (Aemilii), Pierre (Petrus) (1952). Le voyage de Grégoire XI ramenant la Papauté d'Avignon à Rome, 1376-1377 suivi du texte latin et de la traduction franç. de l'Itinerarium Gragerii XI de Pierre Ameilh. [Petrus Amelii] (in French). Florence: Coppini. Cairns, E.Earl. Christianity Throughout the Centuries: A History of the Christian Church, 1996, Zondervan, pp. 241 & 248–250. Gherardi, Alessandro (1868). La guerra dei Fiorentini con Papa Gregorio XI detta la guerra degli otto santi memoria compilata sui documenti dell' archivio fiorentino (in Italian). Firenze: Tipi di Cellini. Jugie, Pierre (2008). La formation intellectuelle du cardinal Pierre Roger de Beaufort, le pape Grégoire XI: nouveau point sur la question (in French). Florence: Sismel. Mirot, Léon (1899). La politique pontificale et le retour du Saint-Siège à Rome en 1376 (in French). Paris: É. Bouillon. Thibault, Paul R. (1986). Pope Gregory XI: the failure of tradition. Lanham MD USA: University Press of America. ISBN 978-0-8191-5463-7. Wikimedia Commons has media related to Pope Gregory XI.